Every year I look forward to the local AKC dog show. I’ve been going to shows as an observer since i was a kid and have always enjoyed them. As I’ve gotten older, I’ve realized that I derive joy not just from meeting and interacting with all the different breeds, but also from the inevitable awkwardness that pervades these types of events. I’ve gone alone to the show the past few years, but this year one of my friends, whom we’ll call Newf (she own a lovely Newfie who is best friends with Mr. T), wanted to go with me. Having never been to one before (and yet somehow she had gone to several cat shows as a child, but that is a different post entirely), I couldn’t wait to see her reaction to the spectacle that is “the dog show”. Mind you, she had never watched “Best in Show” until I forced her to last year. She loved it, thank goodness, or that may have very well been the end of our friendship. Upon arriving at the event center where the show was held, it was obvious that we were in for a treat. Handlers and their dogs milled around outside to get some fresh air, take a bathroom break, or just escape the madness inside. Immediately upon entering the arena, we were bombarded by the “meet the breed” tables. At these booths, breed clubs allowed the public to interact with their beloved breed and were there to answer any questions. And as Newf quickly learned, they would give you more information than you asked for, or ever thought possible. I’ve learned it’s often best to avoid eye contact with the people at these breed tables unless you want to learn everything ranging from the history of the breed, to a particular dog’s lineage, to the bathroom habits of adolescent males. My goal for this portion of the show is generally to interact with the dogs and meet some breeds you don’t commonly see out and about. After all, it’s not often you see a flock of Spinone Italianos or Berger Picards lounging around. One of the most amusing aspects of the “meet the breed” area were the booth decorations that the individual clubs set up. Most tables were fairly sedate with images of their dogs in action, information pamphlets, etc. 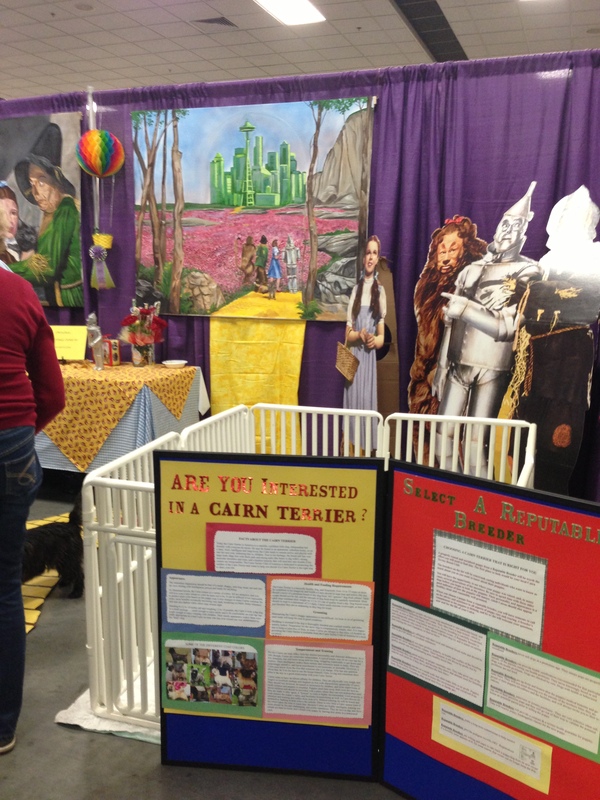 However, a few breed clubs go all out every year and choose epic themes around which to decorate their booths. A few stood out to me this year–the corgi booth with an emphasis on dog butts and the Cairn Terrier booth, fully equipped with all things “The Wizard of Oz”, including a yellow brick road. 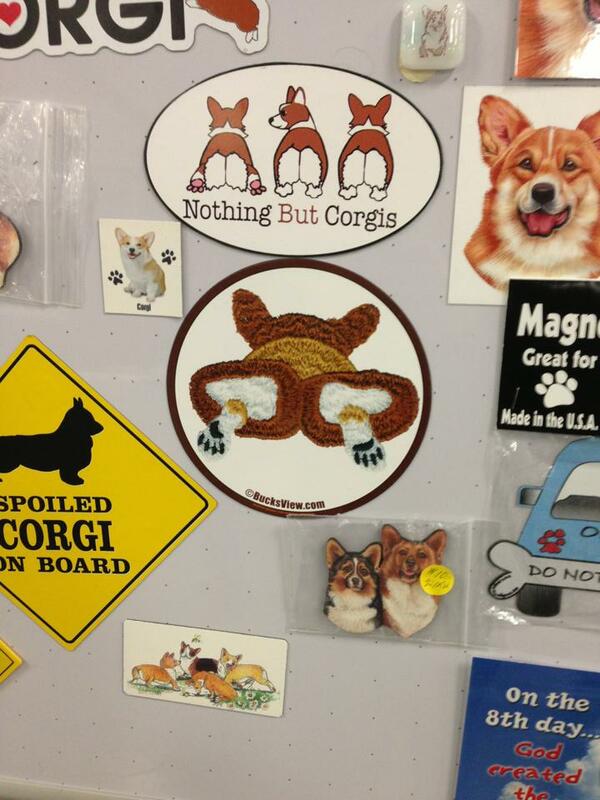 Corgi people have a weird obsession with the fluffy end of their dogs. In Potnoodle’s experience it’s the pointy end you have to watch. Fact: Toto was a Cairn not a Scottie. Other Fact: Most people don’t care. Last Fact: We care. Once we had a chance to meet the breeds, we descended down to the main show floor with hopes of catching a few breed competitions in action. Within minutes of being surrounded by the hubbub of the event, Newf gave me a quizzical look and asked “Are they seriously wearing that? 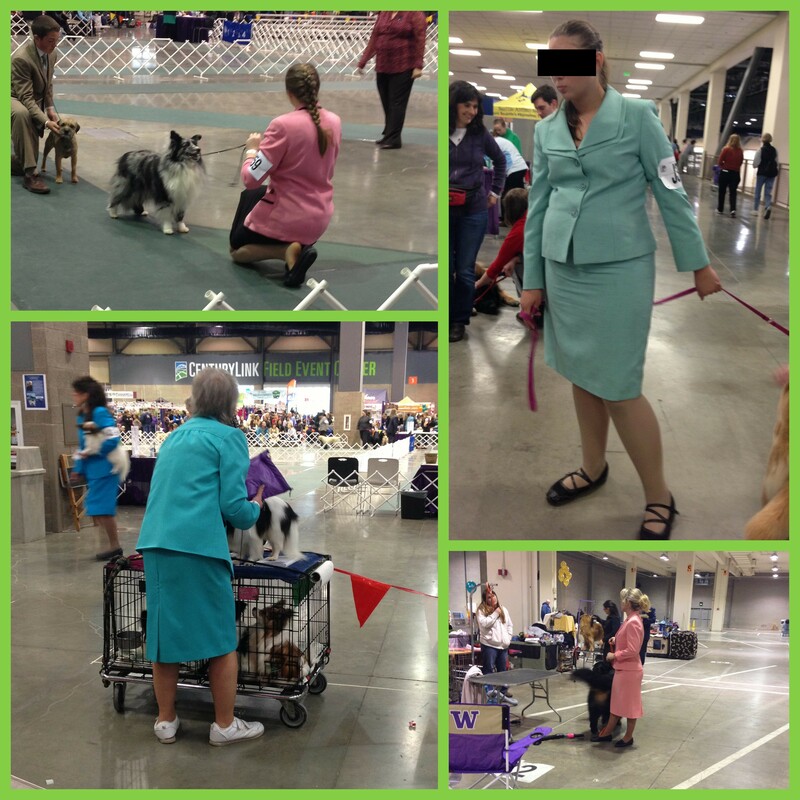 !” Clearly my friend is new to the dog show world, as she was surprised at just how homely most of the female handlers looked. I, for one, was just glad I didn’t see as many sequins as you frequently do at large shows like Westminster or Crufts. I will say that the pastel palette that dominated this particular show was rather reminiscent of the house lived in by the “Golden Girls” Every year I left to wonder where exactly these women dig up these suits and why no one tells them that they look like pastel grannies. Since word simply can’t do it justice, I took a few photos of the worst fashions I saw among handlers. Enjoy. Potnoodle: Handlers need comfortable clothes they can move out in, that complement their dogs and that are decently dressy. We here at The Dog Snobs get that. What we don’t get is the need for shoulder pads and brassy eighties colors. At least the power suits cover their important bits, and for that I thank the flying spaghetti monster, but why the broad shoulders, ladies? I’m pretty sure it does nothing for the dog’s anatomy and honestly… most of the time the dogs just look embarrassed. Fang: Let’s be honest, most of the outfits you will see in the show ring are straight out of Utah. Think ‘Straight out of Compton’ but with sister wives and a whole heck of a lot of hyphenated names. The braids and orthopaedic shoes just bring the outfits together. 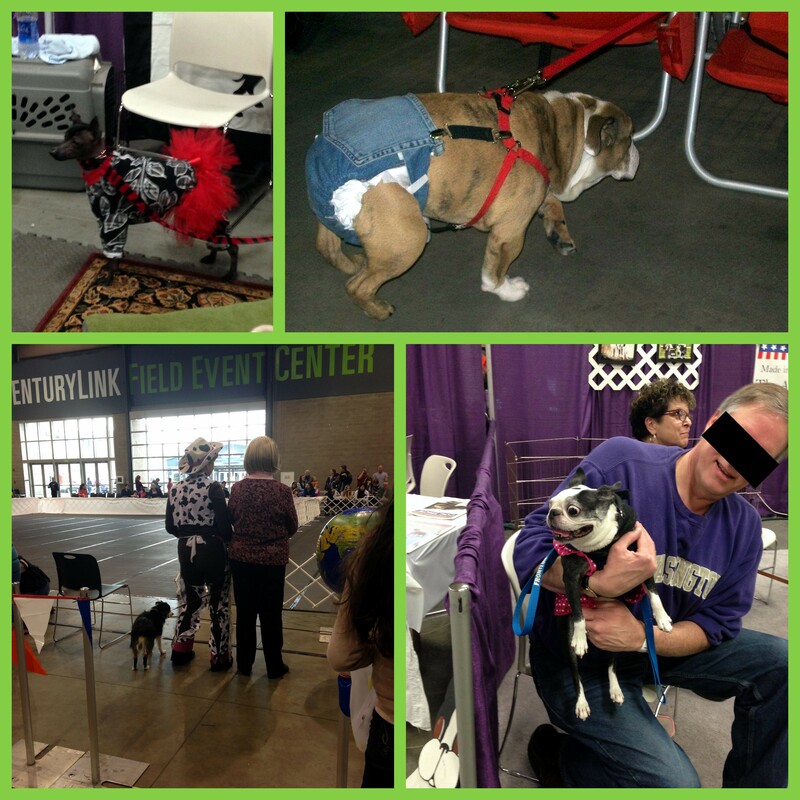 Not be left out, we also saw some glorious dog fashions, ranging from tutus, pajamas, overalls with diapers, and even a few party dresses. If you can imagine it, we saw a dog wearing it. I’m pretty sure Mr. T would kill me in my sleep if I attempted any of this, so either the dogs are incredibly patient or have just plain given up trying. And yes, although technically not dog attire, the cow-print costume on that one woman can only mean one thing: canine freestyle. Newf was in awe that these people even existed and spent quite a bit of time staring at the bedazzled and costumed ladies in disbelief and asking me if it was for real. Yes Newf, sadly it is. Fang: My dogs’ wardrobe for impromptu fashion statements (usually for my own amusement) is virtually non-existent, unless you count their Halloween costumes which usually consist of headgear and some offensively bright ‘Craft STD’ aka glitter but these pictures have me amazed. That’s a whole lot of costume on not a lot of dog. Potnoodle: I try not to judge dogs in clothes, I really do. I rarely dress my own dogs beside the occasional coat and annual Halloween costumes. They’re poodles… they are already close enough to something out of RuPaul’s Drag Race without me adding any sequins or tutus. However, when you have a dog in suspenders… we need to talk about your life choices. Even if it is to keep a diaper on the dog. Not all of our time was spent gawking at unfortunate fashion choices, however. We did spend quite a bit of time watching various breeds in the rings and even caught a few obedience and agility competitors. Watching the dogs strut their stuff in the ring is always fun, as is trying to guess which one would win its class. For the record, I have about a 50% hit rate. I need to work on that. I can’t end this blog without acknowledging how much I actually enjoyed the show from a purely breed enthusiast perspective. Snarking is fun (obviously), but I really do love being able to interact with breeds that I usually only get to see on TV and in dog books. Although the people behind the dogs may have unfortunate fashion sense, there is also something quite nice about being in a giant arena full of other people who love dogs just as much, or more, than you do. Basically, it’s a nice to not be the craziest dog person in the room for a change! Check out some of my favorite dogs below! We’d explain the bib… but the shoe strings are doing that job for us. We’re having Magic Mike flashbacks… in the worst way possible.